The Template Settings options page allows you to control some of display options for your events, styles and customised templates. shown in the short description. Either type the following <!--more--> in the HTML tab after the text you want to display or use the more button. Display event descriptions in the multiple event registration pages? : Same as above but for multiple event registration via the Multiple Event Registration add on. Display addresses in the event listings? : Shows the address in the event listings. Display the address in the registration form? : Shows the venue’s address. Note: Disable the address if you are using the venue manager shortcodes in your event description. Use the custom post types feature? : Allows the use of the built-in Custom Post Type – Events. This will create a page of custom posts for all of your events. 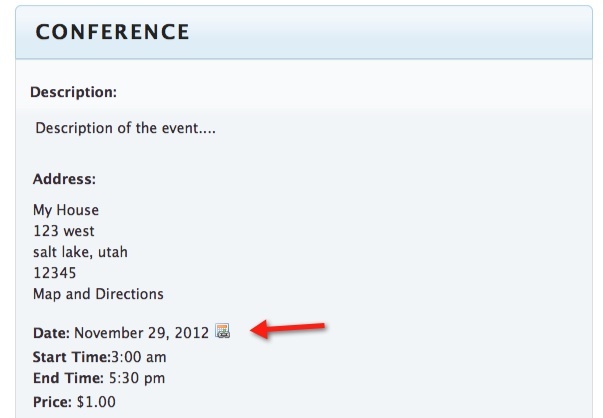 The Espresso Calendar can be set up to point to a post/page or directly to the event registration page by setting the Link to Post option to “Post”. Use the pre-made CPT templates (post-type-samples) that are located in the Event Espresso plugin directory. Copy the files from the ‘event-espresso/post-type-samples’ directory into your current theme directory. 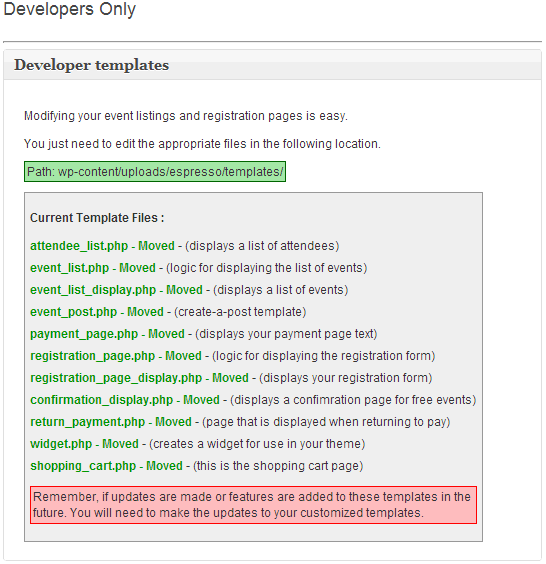 WordPress will then recognize the ‘page-event_list.php’ as a page template. Create a new page and assign it the “Espresso Events” template in the Page Attributes section. This will create a list of “Event Posts” page, once we have some CPT events. In the page Event Espresso > Template Settings > Use the custom post types features? select ‘Yes’ in the drop down. That enables the Custom Post Types feature. Create a new (or edit an existing) event. Under the Create a Post section, select ‘Yes’ to Add/Update post for this event? Then select ‘Espresso Event’ for the Post Type field. The Espresso CPT uses the slug “events”, so if you enable the Custom Post type option there cannot be a published page with a page slug of “events”. Display an “Add to my Calendar” icon/link in the event templates? : Default is yes. This will add a small icon (which can be changed in the templates) to allow a user to download an .ICS file which can be imported into numerous calendar programs such as iCal and Google calendar. See here for an How To to add the ics file to Google Calendar. 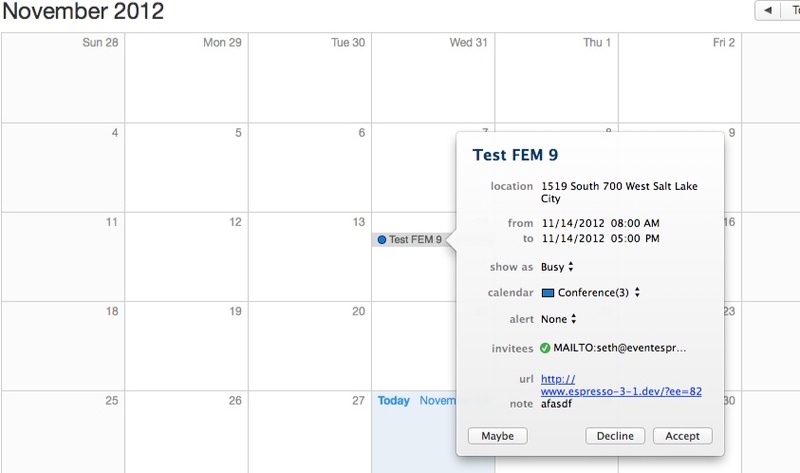 You can also add the iCal link to your emails by using the [add_to_calendar] shortcode. Display featured images in the event list and registration pages? : Default is no. When activated any image added as the featured image in the Event editor will be displayed on the registration page (the single event listing and the Event list. The image can be modified via both CSS and the template files. Add to Calendar and Display featured images are only available from Event Espresso version 3.1.29 onwards. Currently Event Espresso provides two ways of styling the forms and plugin output: Legacy styles and Themeroller styles. PLEASE DO NOT USE THESE UNLESS NECESSARY. Legacy styles are for users still running older versions of Event Espresso and should not be used on newer versions of the plugin. Removed by default since version 3.1.28. Enable Legacy style sheets? : Turns on Legacy styles. Remove the legacy style sheets option? : Completely removes the Legacy styles options from the dashboard. Select Base stylesheet: Use a base stylesheet. Select Optional colors: Select another stylesheet for additional colors. Themeroller is the preferred method of styling your Event Espresso forms and output. Use Themeroller Style Sheets: Activate Themeroller. 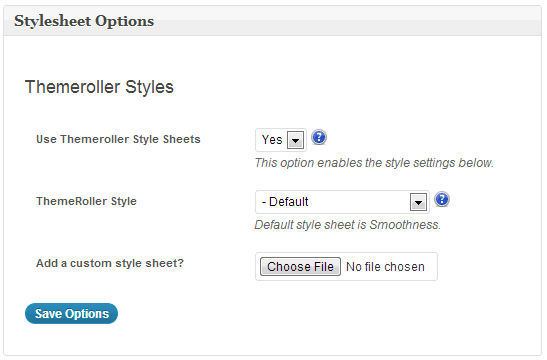 Themeroller Style: Select a style for your forms. Add a custom stylesheet: Upload a custom stylesheet. The best way to modify Event Espresso template files is to copy them from your event-espresso/templates folder to uploads/espresso/templates. This section lists which files have been copied over.